A View From The Cave: The Savior is Matt Damon? The Savior is Matt Damon? 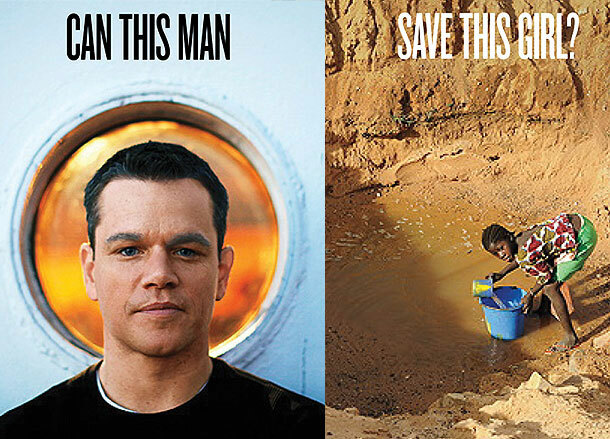 That picture runs atop an article in Fast Company about Matt Damon and the efforts of his charity Water.org. The title of the article is nearly as good: Can Matt Damon Bring Clean Water To Africa? The article reads as the standard foreigner helping the poor narrative. Credit is due for writing a rather expansive piece on Damon, rather than a quick hitter that talks about how great he is because he started his charity. What is unfortunate is that water.org is a pretty darn good organization. From what I have learned, it sounds like they really have a strong model and get what they are doing. The article does show some of the innovative ways they are using microfinance and other tools to improve and sustain their reach. That aside, when will we stop seeing graphics like the one that asks if Damon can save the girl? Why couldn't it ask how he was collaborating with that girl. Better yet, how he is learning from her. The perpetuation of the idea that aid work falls on the helper-helped spectrum really must come to an end. To be explicit and not confuse anyone, this is not intended to say or even suggest that Mr. Damon believes that he will save people in Africa. Rather, it is to point out that this narrative continues to be used when presenting the story of aid projects.